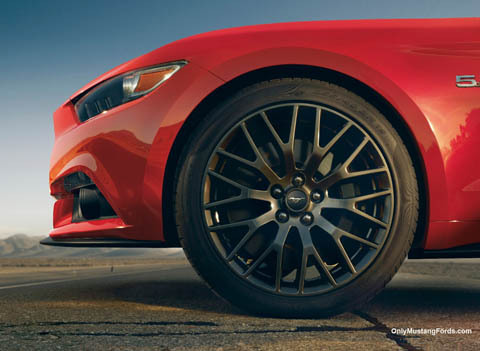 of Ford Motor Company's worldwide roll-out, the world's favorite pony car will feature two important power train options, both of which guarantee a fun, fast ride. New Ford Mustang offical photos have been released, and although you are not yet likely to see pictures of the 2015 Mustang in Australia with right hand drive, what we do see is music to the eyes and ears of long time fans. Looking more worldly than the fifth generation Mustangs, the 2015 Mustang in Australia will nonetheless bear strong styling cues of the latest pony cars, which themselves harken back to the 1968 to 1970 models, with styled headlight pods and the expected triple lens tail lights. One styling cue we won't see, is the "reversed hockey stick" sculpture so common on early models and hinted at, in newer versions. Standard wheels and tires for the Australian cars will be 255/40R19 Y-Rated Summer Tyres at the front and rear. Optional wheels are slated to be 19x9 inch rims on F2455/40 tyres and 19x9.5wheels at the rear mounted to R275/40 series Pirelli P-Zero summer tyres. The good news for Australian pony car enthusiasts is that the new Mustang's interior gets a fresh new face to go with it's new exterior. Beginning in the first 2005 cars, cheap looking hard plastic dashboard covers and car for hire quality door panels covered the interior, which otherwise was reasonably well appointed. Although Ford has made some significant improvements in these areas right up through the 2014 Mustang, there has always been a need for an interior appointment that was up to par with the exterior design and high-tech engine. The Australian market will receive two of the three engine choices available in North America, the new 5.0 Liter 420 horsepower ( 313 kW @ 6500 rpm ) Ti-VCT V8 and a new Ford Ecoboost turbo 2.3 liter, inline 4 cylinder, which is projected to not only provide superior fuel economy, compared to the US V6 models, but at a projected 305 horsepower ( 227 kW @ 5500 rpm ) and more torque. Assuming the Ecoboost engine is a good bit lighter than the V6, one could expect slightly better handling and performance. Available colour choices include Race Red, Competition Orange, Triple Yellow, Deep impact blue, Ruby Red, Black, Magnetic (medium gray), Guard ( dark Gray), Ingot Silver and Oxford White. Although no set date has been mentioned yet by Ford officials, it is expected that the appearance of the 2015 Ford Mustang in Australia dealerships will be late 2014 along with the stateside introduction. Can hardly wait for the order guide!